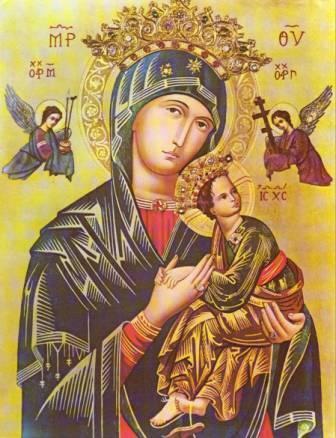 The novena to Our Mother of Perpetual Help can be made on nine consecutive days, or on one day each week for nine weeks. It can be made in Church with others, at home with your family or by yourself. as he faced his passion. in his suffering, death and rising to new life. that we may build up his kingdom among us. from the cross Jesus gave you to us for our Mother. You are the kindest, the most loving of all mothers. While you were on earth, dear Mother you willing shared in the sufferings of your Son. Strengthened by your faith and confidence in the fatherly love of God you accepted the mysterious designs of His Will. We too have our crosses and trials. Sometimes they almost crush us to the ground. Dearest Mother, share with us your abundant faith and confidence in God. Make us aware that God never ceases to love us; that He answers all our prayers in the way that is best for us. Strengthen our hearts to carry the cross in the footsteps of your Divine Son. Help us to realize that he who shares the cross of Christ will certainly share His resurrection. Dearest Mother, as we worry about our own problems let us not forget the needs of others. You always love others so much; help us to do the same. Dearest Mother, help us to avoid sin which separates us from our heavenly Father and from one another. Full of trust in you, we place ourselves under the mantle of your maternal protection and confidently hope for your powerful help. This picture has been a revered icon of hope and inspiration. For three hundred years the picture hung over the main altar in the church of St. Matthew the Apostle in Rome. People came from miles around because of the miracles attributed to this sacred icon. In 1798, the picture was hidden by the monks who fled the city of Rome to avoid being captured by Napoleon's invading armies. The picture resurfaced years later in an Augustinian monastery chapel. Meanwhile the Redemptorists had built the new church of San Alfonso near the site of St. Matthew's... which had been destroyed by Napoleon's invasion force. The Redemptorists learned about the picture and requested that it be returned. Pope Pius IX agreed and on April 26, 1866, the original icon was placed above the high altar in the Church of San Alfonso. "Sancta Mater de Perpetuo Succursu"
Holy Mother of Perpetual Help is a title given to the Blessed Virgin Mary by Pope Pius IX. In 1866 Pope Pius IX entrusted the icon to the Redemptorists and told them to "Make Her Known Throughout the World." The Redemptorist priests and brothers have erected chuches and shrines to Our Mother of Perpetual Help. They have encouraged people to gather each week to pray the novena prayers and then to pray daily in their homes to Mary. Copies of the picture can be seen around the world in churches and homes.